~Flour: Whole wheat pastry flour is not the same as whole wheat flour. It’s a finer grind and will make a lighter cookie. ~Oats: I use Quaker Old-Fashioned Oats, not quick-cooking. ~Oil: I have made these with olive oil, canola oil, and extra light olive oil. All came out good. ~Chocolate: Dark chocolate has antioxidants so the darker the better. I use dark chocolate chips or I sometimes chop up a 70% dark chocolate bar. ~Prunes: They are not all the same. 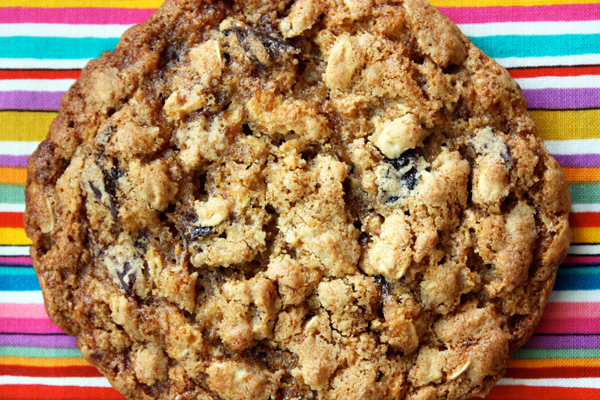 Moist prunes keep the cookie moist so I use Sunsweet Premium Prunes in the round can. If you can’t find these prunes, try pouring boiling water over regular prunes, cover and let stand for 15 minutes, then drain and chop. Without moist and sticky prunes, these cookies will be dry. Why should you make this cookie? It’s all about the fiber in this healthy breakfast cookie, which contains lots and lots of soluble and insoluble fiber. The benefits include everything from lower cholesterol, protection against colon cancer, heart disease & stroke, reduced risk of diverticulitis, hemorrhoids & diabetes as fiber slows the absorption of sugar, more stabilized blood sugar, less constipation, easier weight management because fiber keeps you feeling full longer… but if you increase your fiber, it’s also important to drink plenty of water for it to assimilate properly. But enough about fiber. Make this cookie. Try it. It’s so good, you’ll be doing what I do and having it for dessert too! – Jenny Jones Click here for the recipe. In case anyone finds their cookies to be dry, please make sure to use moist prunes and not the typical ones that are more common. If you can’t find these prunes, try pouring boiling water over regular prunes, cover and let stand for 15 minutes, then drain and chop. 15 Comments on "GIANT Breakfast Cookies"
I have tried many recipes from the cooking shows but they hardly ever turned out. All your recipes turn out great even WW bread mine never did. Oh my….just pulled these out of the oven and they look and smell so delicious! Can’t wait to try one! Getting ready to put a loaf of your no knead white bread in the oven. You make cooking so much fun! Next day..both the bread and the cookies are great. Question: how do you store the cookies, Jenny? Decided to wrap them individually and store them in a box in the freezer. That way I can lay one out each night for the next morning. (Or two if my husband wants one) if I still had four sons at home they would already be gone! Sorry, I couldn’t answer sooner but that is a great way to store them. These cookies can stick together so with every batch, I put some in a large plastic zip top bag, flat so they don’t touch, seal it with all the air removed and just keep it in the fridge (I sometimes freeze them that way in a freezer bag). The remaining cookies go into a plastic Glad container, which I keep in the fridge. I eat these cookies every day and love them! If they are too sticky, you can put some baking soda in a coffee filter at the bottom of the container to absorb some moisture. Sometimes I bake them extra long to make them a bit crispy. Just made my second batch and they look wonderful. These look larger and better; could it be because I had whole wheat pastry flour instead of regular flour? Whatever the reason I now have 12 breakfasts prepared and I can’t wait! 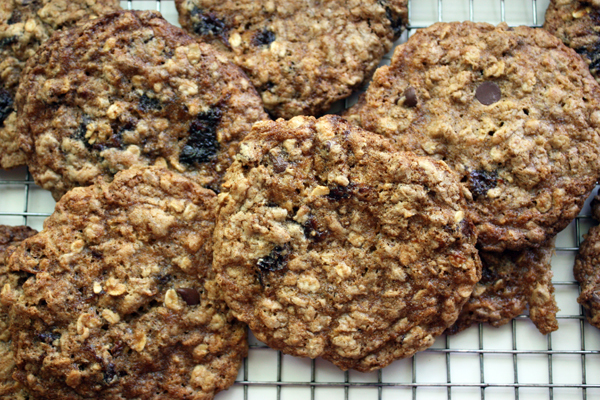 The recipe calls for whole wheat pastry flour and not all-purpose flour and they are large cookies – you should get about a dozen four-inch cookies. Hi Jenny, I’m making these cookies right now, exactly as the recipe states. In the first grocery store I visited, they had no Kellogg’s All Bran Original OR the right prunes, so I went to another store. I would only add that after baking, they’re very soft and need to sit on the baking sheet for a few minutes (or several) before removing to a wire rack. They look and smell delicious. I’m sure they’ll taste wonderful! I’m sorry I don’t count calories so I can’t say how many are in these cookies. Perfect for breakfast with a piece of fruit and a cup of coffee! Lots of fiber, nutrition and flavor and very satisfying. These cookies look and sound so good I just had to make them today. Unfortunately mine don’t look like yours. I used canola oil and the whole wheat pastry flour per the recipe. I couldn’t find the Smart Bran cereal at my store so used All Bran. The dough was dry rather than thick and sticky and was hard to form into a ball so the final result is a dry cookie. Are they supposed to be chewy or more crisp? Thanks for the recipe Jenny. The cookie is very tasty. Maybe the cereal is the issue? First of all, I am so sorry to hear that but thanks for letting me know. The only thing I can think of is that you did not use moist prunes because they do add a lot of moisture. I will pick up some All Bran and try the recipe with that because it should work. I will report back tomorrow. I made this recipe today using canola oil and All Bran (original, not flakes) and they turned out perfect. 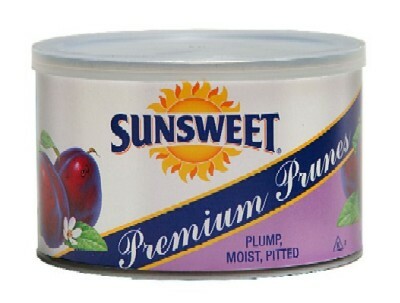 So I think I need to emphasize that the prunes need to be moist, specifically Sunsweet Premium Prunes in a can. I can’t think of any other reason why yours were dry because these were very moist and chewy. If you try again, please let me know how they turn out because I want all of my recipes to work for everyone. Thanks. p.s. I posted a photo of the All Bran cookies above. Thank you so much Jenny. BTW, hubby loved them even on the dry side but he’s a dipper like me. They are great with a cup of coffee! Thank you for making the comparison bake and for the encouragement. You are awesome! And I will give them another try.